I've been noticing an influx of questions lately which not only show a total lack of research, but are completely and thoroughly answered in the product documentation. Such questions almost always get downvoted, and are often closed, but some remain open as there isn't a close reason which quite exactly covers this circumstance. Worse, they often collect answers which are almost always low-quality or completely useless. As you're aware, this is a site for professionals, and as such, reading Google or the product documentation (as appropriate) should be done prior to asking a question. Is the ssh key name a part of the authentication? Adding this close reason, perhaps with slightly different text making reference to documentation, seems to be a good idea. General Reference is not well-liked on SF.SE. Among other things, there's little agreement on what "standard Internet reference source" means. Wikipedia and IMdB are about the only widely accepted reference sites. There was a rancorous discussion recently of whether a Google was a true "reference" site i.e. if a question is well-answered by the top 5-10 hits of a Google search (but none of those are Wikipedia) is it GR? The most recent in-depth discussion includes an answer from Shog9 indicating that GR is likely to go away. Why is it not sufficient to say "if a question is trivial, boring, and demonstrates little to no research, downvote it"? Note that the hover-text for downvoting states quite clearly that a question or answer should be downvoted when it "does not show any research effort" or "it is unclear or not useful"! Downvote it and move on! Not the answer you're looking for? 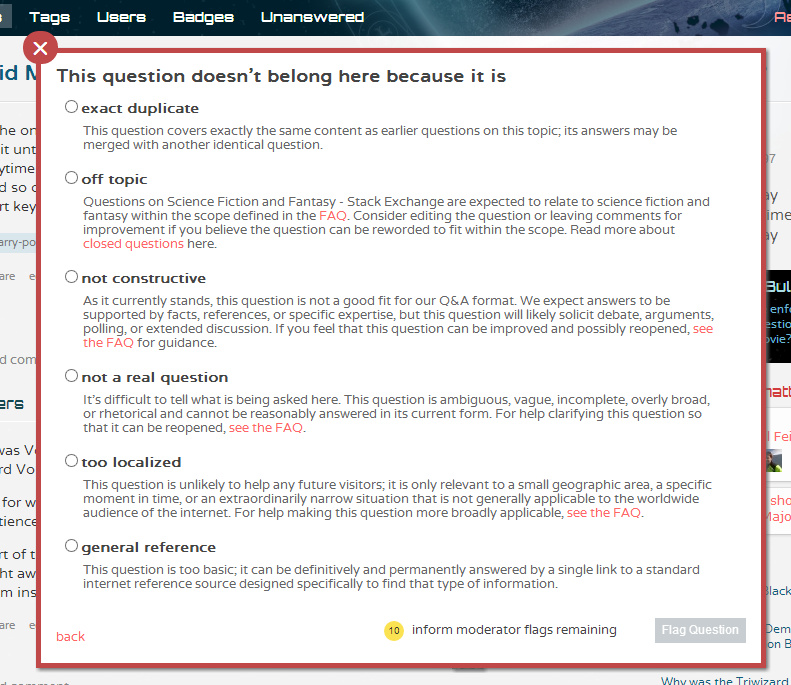 Browse other questions tagged discussion feature-request questions close-reasons .